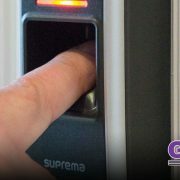 In Part one of our feature on Crestron and access control we discussed the variety of ways that Crestron control systems can be linked to access control devices, such as Crestron deadbolts and biometric readers, for secure and powerful automation. Today we will be taking a look at 3 very different real life applications where the #DoneRightNotEasy crew has put this into practice. For example, the landscaping company was given a code to this door that would only allow them access to the parts of the home where the equipment they needed was stored. 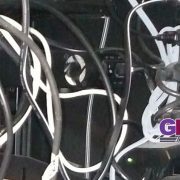 This was done by programming the Crestron system in such a way that upon entering their code, the alarm system in these parts of the home would be bypassed, while the remainder of the home would remain protected. Of course, the housekeeper code would grant access to the majority of the home, but due to the sensitive nature of our clients work, would still protect his home office. This code is written directly into the Crestron control system, providing additional peace of mind to our client without him having to worry about managing the process himself. Here is another unique situation handled in a unique way by the #DoneRightNotEasy crew. 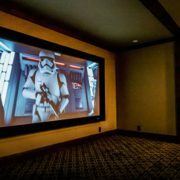 Our client spent his time between his main home and his New Jersey shore home, both automated by Crestron. He was interested in a solution that would allow him to allow grant access to the property at his primary house, regardless of which house he was at, and to boot, he also wanted to actively monitor those who he allowed access. To solve this issue we installed a one of a kind front gate entry system. When you pull up to the gate you ring an intercom, which connects to whichever house the user is currently staying. Once he allows access, we programmed the Crestron system to automatically change the touch screen panel to a 3 by 3 grid of cameras, programmed to dynamically follow the entering vehicle across the property all the way up to the front of the home, and go on to monitor the occupant of that vehicle as they gets out. The end user can then choose to continue monitoring the visitor, or go on about his day with the full knowledge of what is happening on his remote property. One of the many things we excel at here at GMI is the ability to take over existing systems, and bring them up to modern specifications. In the case of our next client, we were contracted to renovate his existing Crestron system, which included a rather old access control system with a numerical keypad and intercom. 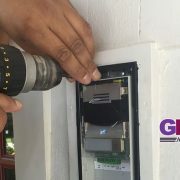 Unlike the Crestron deadbolts we talked about earlier, this keypad was static and relied on a single four digit code, which throughout his tenure at the home he had given out to friends, relatives, housekeepers and others, diminishing the security of the site. Not wanting to remove the existing hardware for aesthetic purposes, we were tasked with creating a custom solution. To do so we built a biometric reader directly into the existing intercom and keypad panel, replacing the keypad portion. Once this was complete our client was presented with a one of a kind access control solution that only the #DoneRightNotEasy crew could provide. The way people access their home is as unique as a person themselves. Our engineers are presented with new challenges on each access control system we integrate, which allows us to engage in our favorite activity; solving problems and giving our end users a simple, intuitive and reliable Crestron control system. 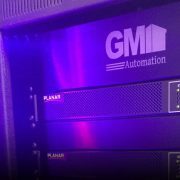 GMI Automation is a full-service automation company that specializes in simple to operate, reliable automation systems that exceed client expectations. Contact us today.